Are you looking for September Home Party ideas for your direct sales or party plan business? September is full of fun, unique holidays that you can use as party themes. As a leader in the industry, I’ve found that customers don’t want to be “sold” to. Hosts and party guests want to have fun, connect, craft, and share in food and conversation. Let’s take a look at all the fun ideas you can use for your home parties in September. My favorites would be “Talk Like a Pirate Day”, “Fortune Cookie Day”, “World Gratitude Day” and “Chocolate Milkshake Day” -just think of all the ways you can incorporate these ideas into an awesome home party, while still keeping things simple! Seriously, you can keep your September parties simple and fun while allowing your products to shine. Keep your party theme as the primary focus, with your products secondary. In case you missed it earlier, PEOPLE DON’T WANT TO BE SOLD TO. They want to have fun and an experience. How can you incorporate your products into these fun themes? I’ve pinned lots of ideas into my September Party Pinterest board. As you look through the board, keep in mind that you don’t have to do EVERYTHING. Just pick a few things, tweek the ideas if you need to, and most importantly have fun! I think you could get a lot of fun interaction with a Talk Like a Pirate Day theme. How about this yummy Rum Punch recipe? The invitations this mom used for her son’s Pirate Party were super cute! It would be easy to draw, cut, and make them yourself. Print out these free Pirate Eye patches and everyone wears one. Of course everyone needs a pirate name too! Have those sticky name tags and guests can write their pirate name from this “Find Your Pirate Name” printable. For real, you can have a Baby Safety Month party! Invite all the moms you know with little ones. Talk about ways to childproof your spaces, and everyone do a show and tell of their favorite products. Talk about car seat safety, and invite a police officer to come and do car seat safety checks. Create a babysitters checklist for guests to take home. If your products have a safety element to them, be sure to talk about that too! There are some great ideas on Pinterest. I don’t know about you, but a Fortune Cookie Day party would be awesome! It’s like a craft and a treat all at the same time! Here’s a great recipe along with a printable with fortunes already done. If you’d rather make paper fortune cookies, here’s a great template. I super-duper love these gold-dipped fortune cookies too. This may sound like a strange party to have, but there’s lots of fun facts about skyscrapers. You can play some trivia games, and then play a game of who can build the highest or strongest skyscraper. Use marshmallows and toothpicks (or dry spaghetti noodles), or play a game of Jenga (write some fun facts about your products on the Jenga pieces). Since September is Childhood Cancer Awareness month, you can do a fundraiser if your company offers a kids product line (donate a certain amount for each product sold from your business), make hats for cancer patients, or do a children’s book drive and donate books to the local children’s oncology floor. Book your September home parties to help propel your business this fall. 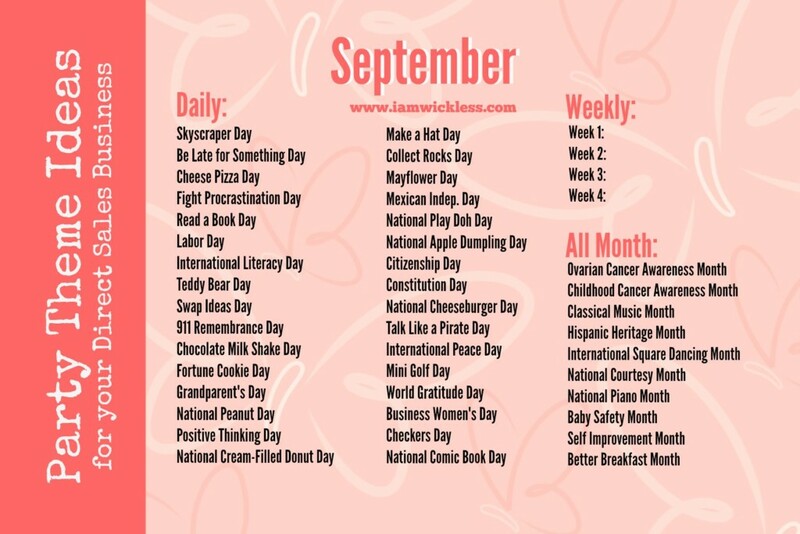 There’s so many ideas and themes you can use for September. Follow my September Party Theme Ideas Pinterest Board, or follow I Am Wickless on Pinterest. Every month I’ll be adding to the list of ideas. Think outside of the box how you can incorporate fun into your home parties. Don’t just sell your products, make your party memorable and you’ll find it a lot easier to get bookings. Craft, snacks, learning new things, coming together for a purpose as you serve the community, these are reasons to come together. Your parties need to be engaging and interactive. For more monthly home party ideas, be sure to follow me on Pinterest.